The main difference between residential garage door openers is the horsepower of their motor and the type of drive system they use. Made to fit the needs of current homes, motor power ranges from ½ horsepower to 1+ units. The weight of the door is the basic determinant factor to consider when choosing a new opener, but the system must also meet the UL 325 official requirements, which state that automatic motor units must integrate safety sensors and a reverse mechanism into their function so that the door will stop and reverse when something obstructs its path. These special features make new age openers more reliable and safe than their old counterparts, but they must be checked and maintained often to ensure their functioning correctly. Our company offers full garage door opener services, ranging from emergency motor repair to maintenance that includes sensor alignment, chain adjustment, and more. We also provide complete opener replacement and installation, and our experts will be happy to help you choose a new model for your home. 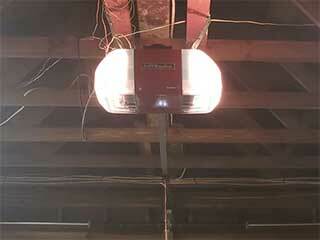 Most garage door motor units have a trolley and work with different drive systems, known as a screw, belt, and chain. The drive system is connected to the motor and transfers electric power to the rest of the system through the trolley and door arm. This is how the door opens and closes automatically, without you having to exert yourself. The opener is set to open and close the door to a certain point if its travel limit is set incorrectly, then it will not open or close the door all the way, which can be a security threat, so these settings will need to be adjusted in order to correct the problem. When it comes to garage door repairs services which involve the automatic motor unit, our team tries to help customers as soon as possible. We provide same day opener troubleshooting services when the source of the problem isn't immediately clear. We bring all the replacement parts we could potentially need with us in order to be able to repair pretty much every issue on the spot without creating delays. There are all sorts of issues that you may experience over time. The opener lights will flash if the reverse system isn't working properly and the door won't be able to move to its closing position. Other problems might relate to the trolley, the iron angle with which the motor unit is attached to the door, or to the chain, motor gears or the safety sensors, which, due to their crucial job, must be checked and tested often, which is one of the key aspects of our maintenance service. Our team at Garage Door Repair Kissimmee works with all of the major brands, including Liftmaster, Craftsman, and Genie, and we can provide you with more than just emergency services, but with new opener models as well. Call us today for more information.